This plant is not related to black pepper. The character 椒 means: hot, spicy, so the tree was called "a spicy something from the mountains". It is also read hajikami はじかみ. We can enjoy the flowers from April to June. Young leaves can be cooked or added raw to salads and soups. Crushed leaves have a very strong fragrance. The still green fruit of the plant. In autumn, it has red fruit, whith black seeds. The ripe and dried fruit is prepared into a powder to sprinkle on food, so is the bark. The dry-roasted ground fruit is an ingredient of the Chinese 'five spice powder'. It is often used in the Japanese kitchen to "overpower" otherwise strongly flavored dishes. 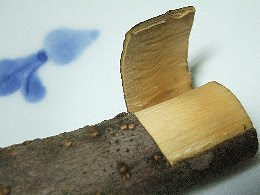 The bark is easy to peel once you have made an incision into the branch after the branch is soaked in water over night. It is then boiled in water and maybe some soy sauce or rice wine is added. It was used as an addition to simmered food like tsukudani or added into onigiri rice balls. The MA 麻婆豆腐 in mabo dofu seems to refer to the bark of this sansho. This is the bark of the tree, not the cover of the seedpods. Speciality of Kyoto. The bark can also be produced to powder. This powder is often used to put on unagi no kabayaki, grilled eel. Mixed with salt, it can be used to sprinkle on tempura and other fried dishes. Branches of the tree are also used to make surikogi pestles. Isei: And do you remember using cyanide to catch fish and insects? Seinosuke: Oh yes. It seems incredible now, but I just used to hang the jar, full of poison, on the wall at home. Isei: What we did with fish was wrap the powder in a piece of cloth, tie it on the end of a stick, and dip it in the river; and in no time at all, fish would float up to the surface. You could bring them round by putting them in clean well water. Surprisingly enough, we even ate the things later; it didn't seem to do us any harm. Another way of doping them was with a mixture of crushed prickly-ash and tea berries. 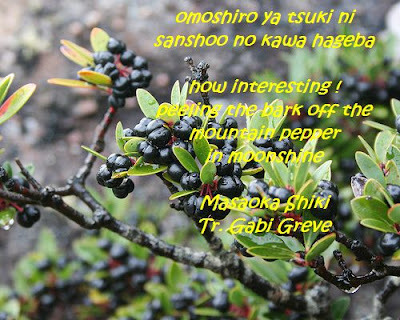 From "Memories of Silk and Straw, A Self-Portrait of Small-Town Japan,"
In mid-autumn, the small tree known as sansho, or Japanese prickly ash (Zanthoxylum piperitum) , produces red berries. As they ripen they turn brown and split to reveal shiny black seeds. Traditionally, the seeds are ground with a pestle made from prickly ash wood, and this produces one of the few spices used in Japanese cuisine. The resulting sansho pepper is pungent with a lemony tang, and it is popular sprinkled over unagi (grilled eel). The tender spring leaves are also aromatic and make attractive garnishes for dishes such as goma-dofu (sesame tofu). However, there is a spectacular insect that also finds the leaves tasty. The beautiful swallowtail butterfly often lays its eggs on prickly ash shrubs, so at this time of year you might find large, bright-green caterpillars steadily munching their way through the last of the autumn leaves. They are very neat eaters, and can pick the small leaflets clean, leavingjust the prickly veins behind. Last year I found several of these caterpillars on a small prickly ash tree, and one day, around the end of October, I watched one of them attach itself to the spiny tree trunk with a silk thread. A few minutes later it started to change color, and soon it became a chrysalis, well camouflaged against the rough bark where it would sleep the whole winter through. refering to a person who might be small of stature, but with a sharp intelligent mind. Gabi san thank you for sansyou topics. Why did he feel interest to peel the bark of the tree? Please don't say, you're a an ordinary person and Shiki is a genius. I found this translation of a short story, by Kenji Miyazawa, which mentions pepper-tree bark being used as a fish poison! "Peel the bark from a pepper tree at midnight of a springtime Day of the Horse. Dry the bark twice, but only during the 18 days before the seasons change. Grind the dried pepper bark finely in a mortar and pestle. Then, on a sunny day, take 1 kan-me (about 4 kg) of this powder and add 700 mon-me (about 280 g) of maple ash to it. Keep the mix in a cloth bag. When you go fishing, put the bag in the water and rub it between your hands so that the poison powder seeps out. When the fish drink the poison powder, they will gasp for breath for a short time before rolling over and floating to the surface dead, white underbellies to the sky." In the Prauhanian language, this technique is known as "Eppu-kappu" and the most important job of the Prauha Police Force is to make sure that nobody does it and to arrest anyone who tries. But maybe this is a different kind of pepper tree, and Prauha might be somewhere in the Indian sub-continent. The branch is also used as a pestle with a suribachi http://en.wikipedia.org/wiki/Surikogi grinding with a pepper stick adds to the flavour of the ground food. Sanshou is also known as Sichuan Pepper. In the hunt for vegetarian-friendly fare in Japan, it’s easy to forget that what often makes the dish is not the main ingredient but the seasoning. I was reminded of this on a recent shinkansen ride. With 10 minutes to board my train, and it being dinner time, I picked up a few items to eat along the way. Steering clear of the many bento (boxed lunch) stands (the search for the elusive vegetarian bento is one I’ll have to save for another time), I found some skewered vegetables behind one glass case. Easy enough, I ordered some potatoes, brussels sprouts, bamboo and a yellow tofu-looking thing (which I later found out was not tofu but namafu, or wheat starch). ... Japan offers a plethora of spices and seasonings to match its cuisine, but here are a few of my favorite staples. Sansho, it turns out, is one ingredient of shichimi, Japan’s pervasive “seven-flavor” spice concoction. Made with red pepper, sansho, orange peel, black and white sesame seeds, seaweed and, depending on the region, hemp seeds, shiso (perilla) or ginger. Usually shichimi sits out on the table in little bamboo or gourd containers at noodle shops. The color and mix varies from place to place, but it is essentially a mild chili topping with a bit of zest. A bowl of udon noodles is not complete without a dash or two of this on top.